The thing is, I grew up with bone broth, before bone broth becomes a gut-friendly super food. 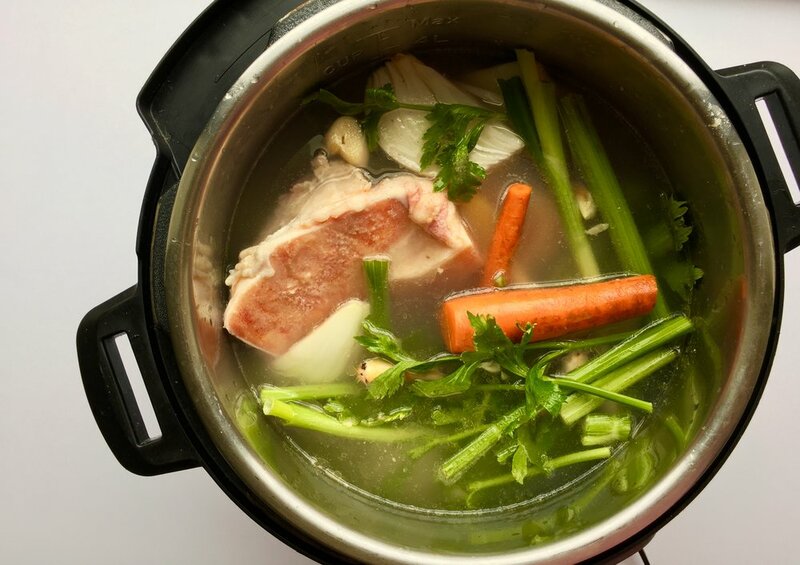 To me, bone broth is a traditional food, an integral part of my diet, a soup my mom would make to serve with a plate of steamed fish and stir fried greens. Finally, after having these soups in my entire life, I’m learning that bone broth is good for your joints, your skin, your gut, your immune health and just about everything else. Some ancient mama wisdom there! 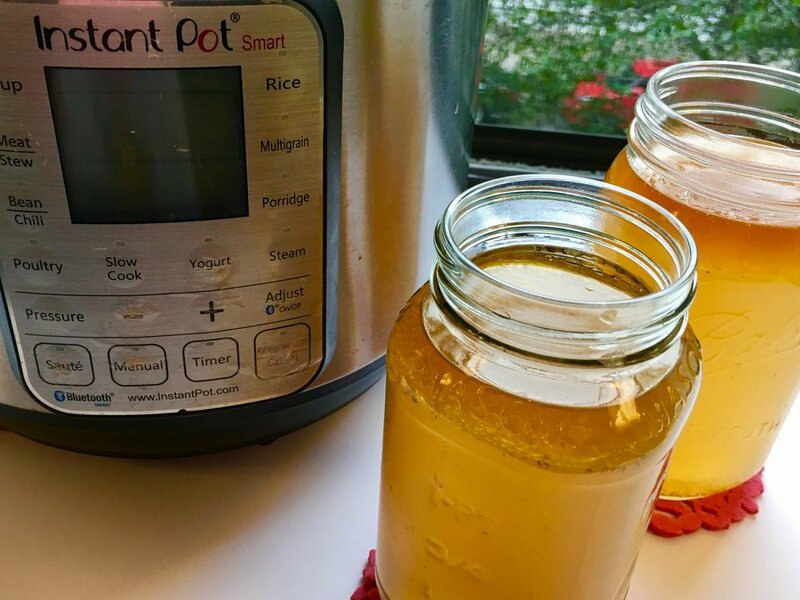 Now I make bone broth in an Instant Pot, with or without Chinese herbs, as a soup base for noodles or broth for cooking. It is easier to make than you think! Start with collecting vegetable scraps or using a standard assortment of veggies such as carrots, celery, mushroom stems, ginger, garlic, onion and scallions. Put vegetables in an Instant Pot with roughly 2 pounds of bones. I used beef bones here but you may use chicken, pork, turkey or fish. Add a dash of apple cider vinegar, salt and enough water to cover the veggies and bones. Seal the pot and cook at high pressure for 120 minutes. Allow pressure to release naturally. Let the broth cool before straining into jars for storage. Refrigerate overnight. Scoop off the excess fat that settles on the top and discard the next day. 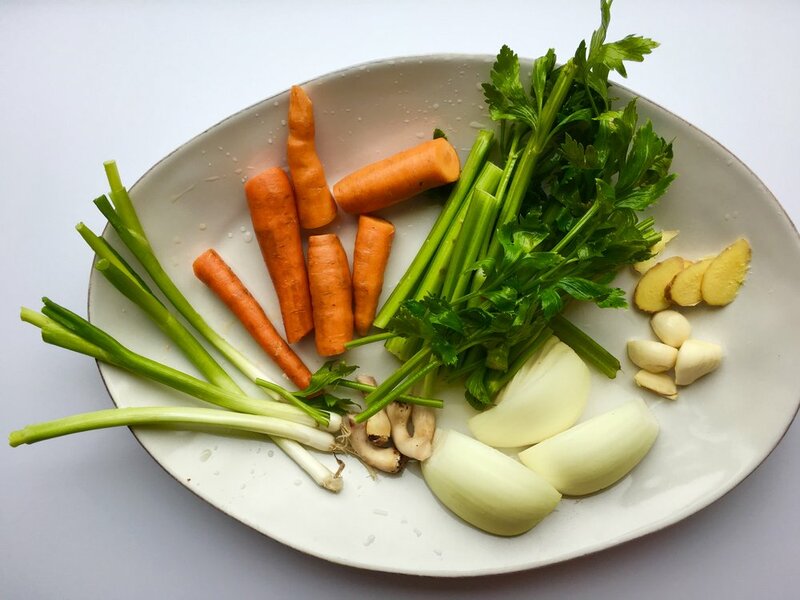 Place bones, all vegetables, herbs, aromatics, vinegar into Instant Pot. Add enough water to just cover the bones and vegetables in the pot. Select ‘Manual’ setting and adjust time to 120 minutes (keep hitting minus till it reaches zero, hit minus again and it will automatically land on 120 minutes). When cooking is done, allow pressure to release naturally (this might take 20-30 minutes). Allow broth to cool before straining into jars for storage. Switch Instant Pot to Sauté Mode. When hot, put in 1 tablespoon of olive oil. Add zucchini, a sprinkle salt and brown for a few minutes. Remove from pot and set aside. Add I more tablespoon of olive oil, throw in onion, shallot and garlic and sauté for a few minutes. Add mushrooms. Mix in oregano and basil. Stir and cook for a few minutes. Deglaze the pot with sherry wine, add broth, tamari, fish sauce (if used). Pour in (dry, uncooked) pasta, stir in tomato paste. Make sure pasta is submerged in the sauce completely. If not, add more water. Close the lid. Switch Instant Pot to Manual Mode and cook for 4 minutes at high pressure. When 4 minutes is up, wait 5 minutes and use the quick release method to de-pressurize. Open the lid. If the pasta is too al dente, close the lid and leave it in the pot for a few extra minutes. Stir in zucchini. Season with salt and pepper. Switch Instant Pot to Sauté Mode. When the pot is warm, add olive oil, sauté onion for a few minutes. Add garlic and sauté for another minute. Add carrots and celery. Cook for a few minutes. Put in oregano, basil and bay leaves. Stir and mix well. Put in lentils and tomatoes. Add broth or a combination of broth and water. Stir and mix. Close the lid. Switch Instant Pot to Manual Mode. Put it on for 12 minutes at high pressure. When 12 minutes is up, use the quick release method to de- pressurize immediately. Open the lid. Add vinegar, salt and pepper to taste. Throw in spinach or favorite greens to serve. BUY AN INSTANT POT HERE. Always having pre-cooked protein in the fridge is one of my top kitchen practices. And what is an easier way to make a big batch of shredded chicken than the Instant Pot? Add 1 cup of water to Instant Pot. Put a steamer rack down, add 2 pieces of chicken breasts on top. Layer a steamer basket on top of the first tier of chicken breasts. Put 2 more pieces of chicken breasts on top to create a second tier. Close the lid and cook on High Pressure for 5 minutes. Open the lid. Take out the chicken breasts and set them on a plate to cool off for 5-10 minutes. Shred the chicken breasts with your hands or 2 forks. Store them in containers. Refrigerate or freeze. What do you do do with a big stash of shredded chicken? I fortify my noodle soups and lentil soups with the extra protein and make delicious salads and stir-fries with it. I broke out my long down jacket today, so winter is officially on for me! The colder weather means less salads, more cooked vegetables and hot soups. I usually make a variety of meat-based and vegetable soups because having a diverse diet is the cornerstone of my eating approach. 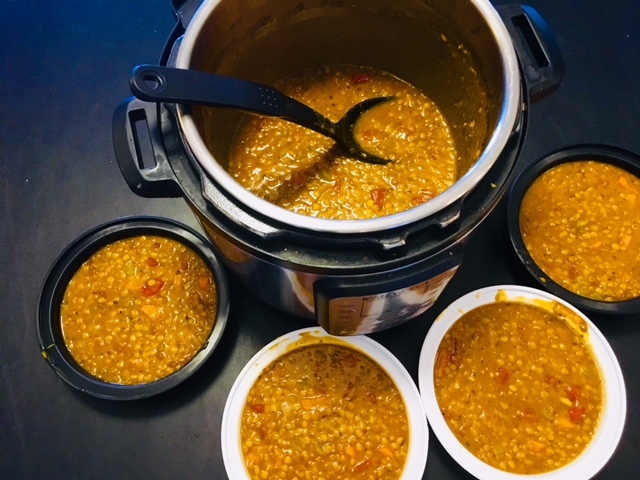 Many soups also happen to be one-pot meals that freeze really well, so if you have a big pot of something, freeze them in meal size portions and rotate them throughout the looooong winter months! Here is an Instant Pot chicken soup recipe inspired by SimplyRecipes.com that requires throwing all ingredients in an Instant Pot, pressing 1 button and walking away for an hour. I freeze the cooked soup in 4 meal size portions. What I love about this picture is I have 4 home-made frozen meals all ready to go on busy nights. (The bottom container is actually an Instant Pot Coconut Chickpea Curry). Put the chicken in the Instant Pot, breast side up. Layer all ingredients on top, pour in water. Close the lid of the Instant Pot and make sure the pressure regulator is in "sealing" position. Select the “Manual” program, set the time to 25 minutes at high pressure. When done, let the pressure release naturally. (The total time it takes for the pressure cooker to come up to pressure, cook and depressurize is a little over an hour). What are you eating in this heat? Here is my simple summer dinner - boiled corn, sauted broccoli rabe, cold soba noodles (100% gluten free buckwheat noodles) and no-cook tofu avocado salad. The beauty of this dinner is I used the same dressing for the soba noodles and tofu salad. I sprinkled sesame seeds and furikake after I tossed in the dressing. Super coolicious! My daughter's favorite dinner - steak and mashed potatoes! Except for tonight I made a potato-less mash with millet and cauliflower, a protein-packed whole grain with a complex carb. She LOVED it!! For all comfort food lovers out there, make this healthy mash! Put drained millet, cauliflower, water and salt in a pot. Bring to a boil. Cover pot, reduce heat to low, and simmer for 30 minutes or until millet is fluffy and soft and all liquid is absorbed. Remove from heat. Add butter (optional). Let sit for 5 minutes. Mash until creamy with a potato masher or heavy spoon. Add more salt and black pepper to taste. Cover pot again for 5 minutes before serving. I served mine with a hearty black bean stew on top. Try yours with scallion, garlic, tamari or any favorite oils or herbs of your choice!